Old Man: It’s dangerous to go it alone. Here, take this. Link: But, what am I supposed to do with it? Some of the more thrilling parts of life are the times that you’re anxious, you don’t know what’s coming up, but it’s approaching fast and all you can do is traverse yourself through it. You’re given something new and unexpected and you are forced to adapt with the goal of thriving in a new environment. This can also be a source of fear and concern because you aren’t in the normal comfort zone that you once thrived in when getting to this point, yet you’re expected to perform at the high quality that got you to this point? You don’t even know if the rules have changed at this point, the tools being the same, or the uses of any new tools that you may come across. Of course I’m referring to game design and not my previous post, silly person. But why can’t these causes for frustration and anxiety translate between gaming and real life? If the tools you’re given aren’t explained to you and the tasks that are presented to you require a certain level of proficiency using those tools, how are you supposed to operate at a level of high proficiency? You show up to German class, no experience but eager to learn, start of a new school term, and on day one the teacher gives you a dictionary and tells you to pull out a pen because you have an in-class essay written in German due today. Reoccurring Second Language nightmares all over again. You would have expected some time to try and learn a little bit about German, the grammar and the sentence structure, the lexicographic philosophy that the language tries to follow, or at the very least learn how to use the English to German dictionary before you become tested on it. Picture a different scenario. You’ve had a few lessons in German class where some things were taught. You learned a bit of the sentence structure, the word formation, and the general grammar of the language. The next lesson, the teacher holds a Pop Quiz for the class which asks you to write a paragraph or two in your own words, but you still have access to the dictionary from day one. You have little assistance with the paper, but you at least had practice with the tools that were given and are least equipped to deal with what is being quizzed. Your level of proficiency, however, will be determined by how mindfully you’ve practiced. This goes back to the diagram above in designing scenarios that don’t feel overwhelmingly, impossibly difficult to the player, but pushes the player just past their comfort-zone in order to keep the game from doable but still difficult. The first scenario given illustrates being given an impossible task with the result of not wanting to continue at all. The second illustrates being taught how to handle a set of obstacles and testing you on how to apply what you’ve learned in order to solve a new set of similar but still challenging obstacles. 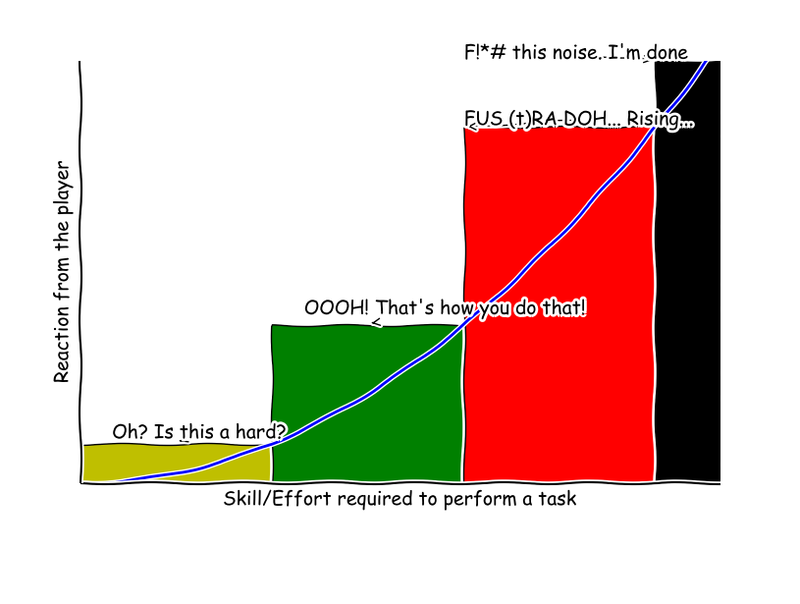 I used this diagram when I originally talked about starting screens and introducing a player to a new environment, but the same kind of principles apply when the designer has a new set of challenges designed as obstacles for the player. The player still needs an environment to play with the tools, learn the tools, and learn the rules for using the new tools before being tested on integrating that knowledge in the game. But there is an inherent philosophy of how the game designer wants the player to approach the game. The fuzzier the rules are taught to the player, the less time that the player has to learn those rules, even the pace of movement in the game, then the more your game resembles Reactive Gameplay, or Reactive Game Design. The opposite approach to this is Planned Gameplay, or Planned Game Design. These two design philosophies aren’t mutually exclusive, but there are games that emphasis one drastically over the other. 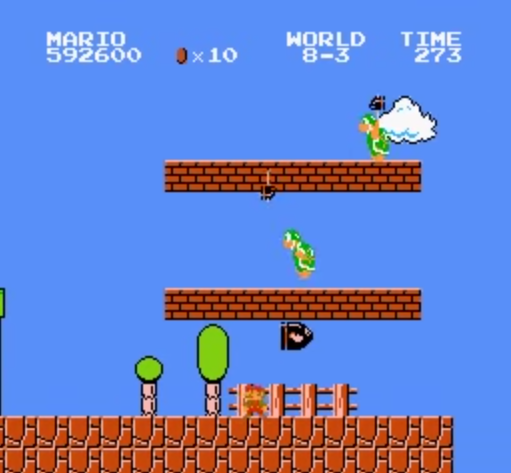 In any game, especially platformers or shooters, when you come across a new level, it starts out with Reactive Gameplay to some degree until something unexpected comes up, or a difficult segments appears. But the more you play a level, the more practice you have with the tools you’re given and the quicker the transition comes goes from Reactionary Gameplay to Planned Gameplay. The more difficult a section, difficult because of bad tools, bad teaching, and/or not enough practice with the tools then the more repetitions needed before your Reactive Gameplay can resemble Planned Gameplay. Not only tied for the worst phrase to exist in the gaming vernacular, but also an easy to illustrate example of a tool that was taught well to the player. It is easy to perform, double tap the R or Z button. It is easy to understand its use, deflecting projectiles. 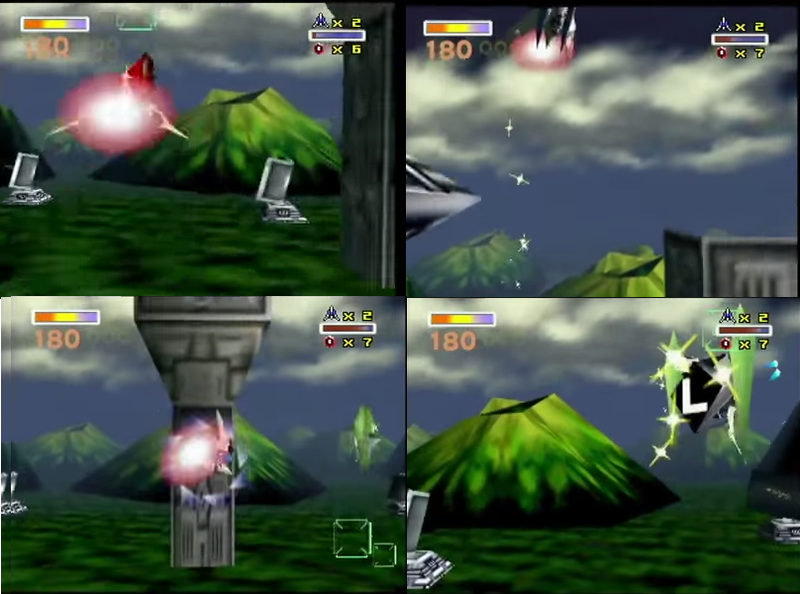 You don’t need a lot of time in order to master its use, you need enemies that are shooting at you and the enemies are sparse in earlier levels, so you can practice the Barrel Roll early and often and get used to spamming it when bullet fire gets a bit more hectic in later stages of the game. This is a picture of when Peppy tells you when to first use the Somersault Flip. You use it, and let some enemies behind you get ahead of you. Something that using the “Brake” mechanic earlier in the game taught us. Not on your first run through. I guarantee. This is the first point where the Somersault Flip is actually useful, which happens to be earlier in the stage. You know what else? This move is extremely difficult to use as intended when you first get it. It’s extremely easy to use the flip and miss one or more of your intended targets. This is because while easy to perform, the player isn’t given enough opportunities to practice and master the precise movements of the mechanic. 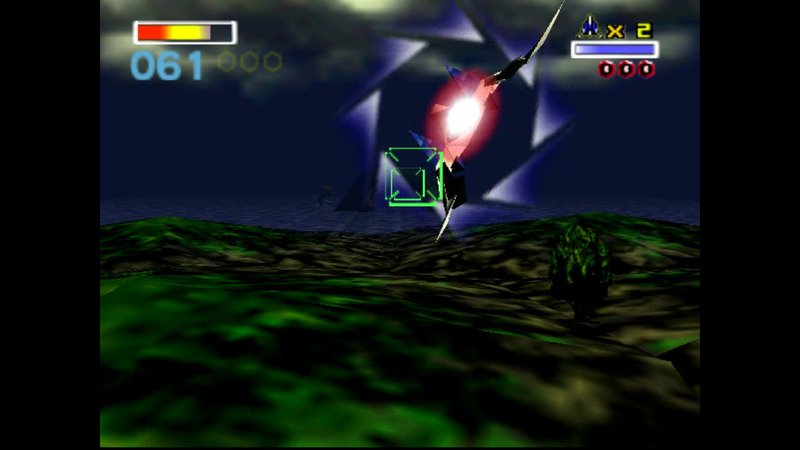 The actions that you can perform with the Arwing in Star Fox 64 are easy to execute, much like most mechanics in any Nintendo Game, which lends a generous learning curve from Reactive to Planned Gameplay. 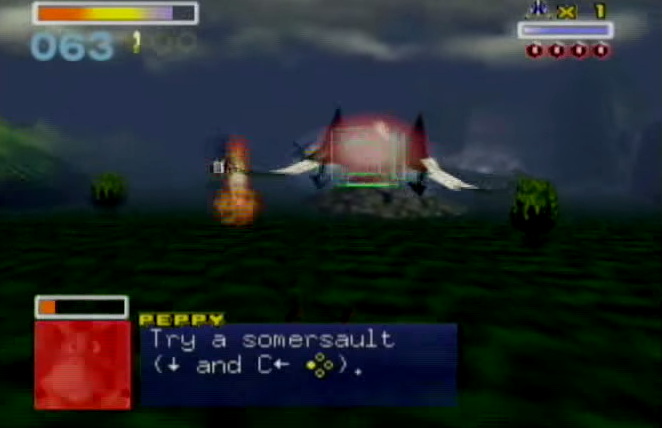 With the Barrel Roll, it is easy to make the Reactive to Planned transition in regards to shifting the player’s focus from learning how and when to perform the Barrel Roll to having the Barrel Roll be an intuitive, easy to plan action which helps refocuse the player’s attention to other obstacles occurring on the screen. The Somersault Flip, on the other hand, takes much longer to master and goes underdeveloped and in the periphery of the player’s toolbox, which leaves its use under Reactionary Gameplay for a much longer duration than most of the other moves that are possible to perform. More on the matter in another post, time is running thin tonight. Exploring more ways to teach the player in the future. Follow the tag.